Common; Reddish fawn with white spots along its flanks and back during the summer, turning dull brown to grey (with no distinct spots) in winter. Menil; Spots are more distinct than common in summer and no black is seen around the rump patch or on the tail. In winter, spots are still clear on a darker brown coat. Melanistic (black); The coat is black shading to greyish brown throughout the year. No light-coloured tail patch or spots are seen. Leucistic (white); Fawns are cream-coloured; adults become pure white. Dark eyes and nose are seen, with no spots. 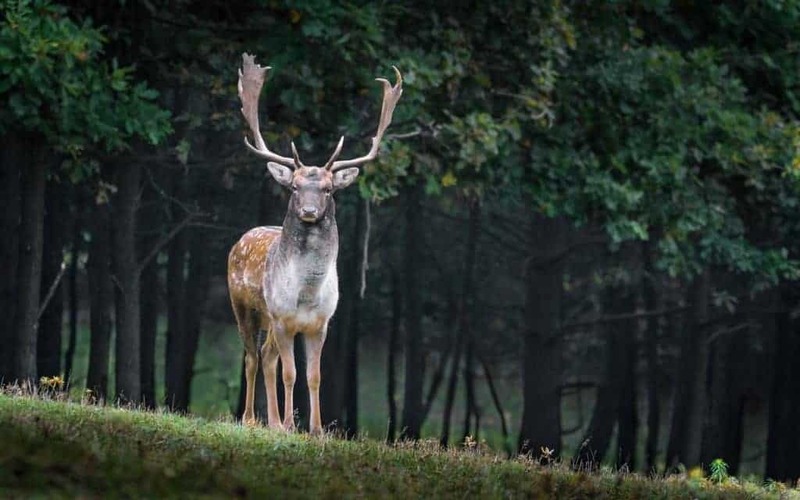 The long-haired variety of Fallow Deer is known only from one location; the Mortimer Forest in Shropshire, England where it was first noted in the 1950’s. This population have body hairs which are often curly and more than twice the usual length (and often longer). It also has hairs on the tail, inside the ears and on the forehead. Its hair grows faster and over a longer period, but the characteristic declines with age.